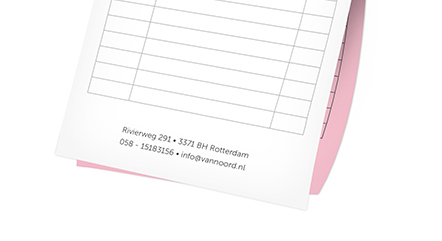 NCR Sets are often used to duplicate handwriting onto all layers of a multipart sets - commonly used for invoices, order details or client notes. 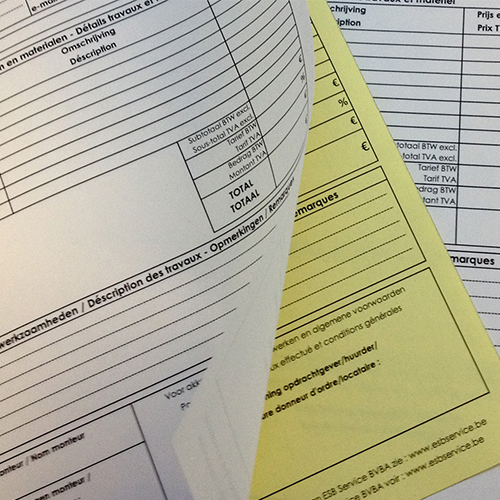 At Helloprint, you can get your Individual NCR Sets with either two or three sheets. Our NCR Sets are available in A6, A5 and A4 sizes! Keep 4 mm safety margin and 11 mm for the wire side. Resolution of at least 300 dpi. The first sheet will be printed full colour with your own design and will be perfectly writable. The second sheet will be blue and the third sheet will be pink. Both will be printed in black. 3 Do you want numbered copypads? 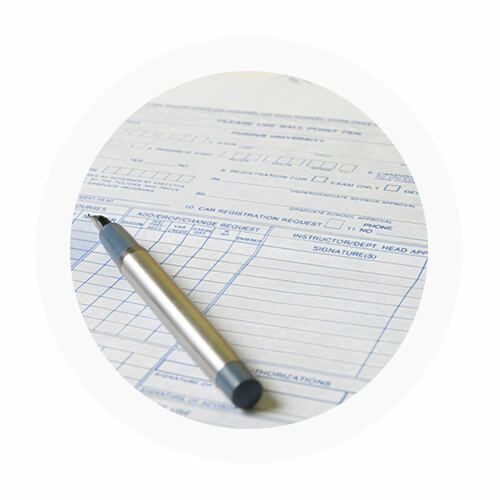 At Helloprint, you can number your pads for your administration. This will be a 6-digit number, starting at 000001. If requested otherwise, please contact us. Make sure you let us know where we should place the numbering by adding a box to your design (with or without border) of minimum 20 x 8 mm to your design. Use a light color for the box as numbering always takes place in 100% black. 4 How many bundles would you like? In order to guarantee the best prices on all our products, we only offer the most popular print runs below. Make sure you contact us if you need a different print run, we make exceptions in most cases! To allow leeway for cutting differences in production, always add a bleed of 3 mm around all edges of your design. Make sure colours, background pictures and layouts extend into the bleed area so as to avoid leaving white lines as a result of cutting tolerances. You can submit your file with crop marks and printer's marks. For this product we need all important text and images to be at least 11 mm away from the wire. That means you should deliver your artwork with 11 mm margin on the left for odd pages, and 11 mm margin on the right for even pages. For top, bottom and oposite side of the wire keep all important text and images at least 4 mm away from the edge of the finished size. Make sure the resolution of the images and graphics in your artwork are at least 300 dpi. Let us know where we should place the numbering by adding a box to your design (with or without border) of minimum 20 x 8 mm to your design. The position of the box can be anywhere within the margin requirements. Numbering is always done in 100% black, therefore we recommend to use light colours for the box as this will also be printed. Do not place the numbers yourself, since we will add the numbering. For numbering we always start from 000001 and use the font Helvetica Bold 12 pt unless requested otherwise. Use the right values for full color black. Use Rich Black (C:63% M:52% Y:51% K:100%) for larger areas and text to get a deep black color. Do not use this value for text smaller than 15 pt or plain text. This can only be used in full color printing. For designing black smaller texts use 100% black. Make sure the ink coverage isn't higher than 300%. Force Color Images to CMYK with a 260% ink limit (in Photoshop > Convert Color Profile > Photoshop 5 Default CMYK). Make sure the ink coverage isn't higher than 300%. Lines should be at least 0.25 pt. Lines should be at least 0.25 pt. Negative lines should be at least 0.5 pt. copy sets, is a glued set consisting of 1 white frontsheet, and 1 or 2 (depending on your choice) backsheets. The text you write on the frontsheet, will be copied through on the backsheets. For the delivery of your copy sets we use multiple carriers. Because of the highest reliability, in most cases we use UPS or DPD. The copy sets that is chosen in most cases can be selected via our website. On which side will the Copy sets by glued together? The Copy sets will be glued together on the top. 80 gsm offset: This is the most often-used paper for Copy sets. The thin paper makes it easy to tear off. Because of it's structure the Copy sets are perfect to write on. 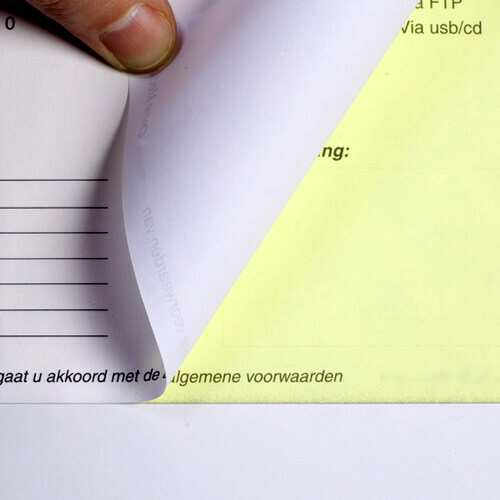 60 gsm offset: This paper is mostly used for the backsheets. Reinforced cartboard: The back side is made from reinforced cartboard with a thickness of 1mm. How are my writing sets numbered? The size Copy sets are numbered with 6 digits for technical reasons. By default, the number starts at 000001. If you want a different number, please contact us. Out of how many sheets exists a set? A set consists, depending on your choice, of 2 or 3 sheets. 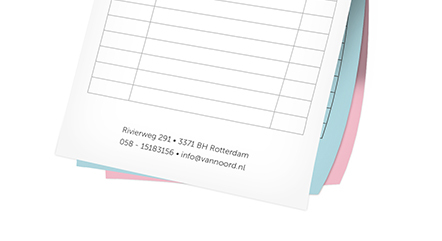 A set of 2 sheets consists of one white and one colored backsheet. A set of three sheets consists of one white sheet, and two colored backsheets. Will my Copy sets be printed in full colours? The white frontsheets are printed in full colour on one side. The coloured backsheets are printed in 1 colour (black).